Who provides/creates social content within your organization? Nessa Ferrell (Wolf Trap): As the Social Communications Coordinator at Wolf Trap, I am responsible for curating and organizing content for the day-to-day social calendar. This includes writing daily posts, writing and/or editing copy for promotional content, and responding to users across our social platforms. When working with specific departments, such as Education, Membership, or Opera, we work together to ensure the copy is on brand, the visual content is exciting, and we’re sharing overall messaging goals. Working with multiple stakeholders allows us to incorporate the in-depth knowledge and expertise from across the organization. For example, the Education department knows its programs and productions very well – and understands its target audience – so it makes sense to have them contribute content specific to their department and goals. Once that content is received, I provide feedback and edit the content to keep it true to the Wolf Trap brand. In terms of visual content, we have an amazing creative team that creates visuals, videos, infographics, and other assets. Plus, everyone at Wolf Trap loves social content and always seems to have their eyes open for fun content that we may want to share on our channels. 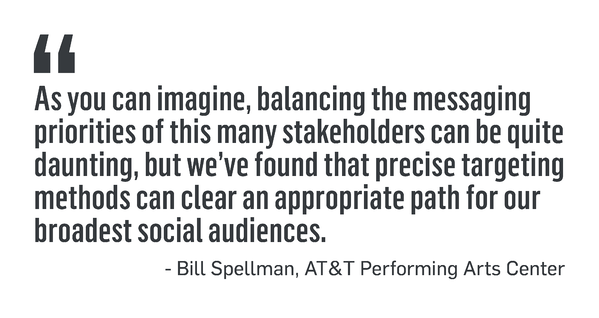 Bill Spellman (AT&T Performing Arts Center): AT&T Performing Arts Center’s institutional social content is primarily created by the Digital Marketing team, with submissions and input from Programming, Development, External Affairs, Education, Group Sales and our Executive Leadership team. Contributions from critical stakeholders ensure that we are presenting the full picture of our organization's mission and accomplishments, as well as identifying opportunities to reach new audiences. As you can imagine, balancing the messaging priorities of this many stakeholders can be quite daunting, but we’ve found that precise targeting methods, such as promoted dark posts and posts within Facebook events, can help clear an appropriate path for our broadest social audiences. Jonathan Stiles (Pennsylvania Ballet): The majority of Pennsylvania Ballet’s content is managed by our Digital Marketing and Promotions Coordinator, Laura Bowman. She produces some of our content, as well as handles assets from our rehearsal photographer (Principal Dancer Arian Molina Soca), and the freelance photographers and videographers we hire from our performances. This past season, we transitioned our Instagram account over to a small group of dancers. Laura Bowman (Pennsylvania Ballet): When creating content for our social media platforms, our goal is to tell the story of our incredible artists and programs, as well as sell tickets to our performances. The posts range from sharing a beautiful photo on #TutuTuesday to a video showing the dancers hard work in the studio. I also like to feature our Community Engagement programs when possible and create one weekly post that runs throughout the season. Two years ago, we created #MeetADancerMonday, and this past season we started #FunFactFriday. These posts ensure each dancer has the opportunity to be featured during the season, and that our followers get a chance to know the dancers on a more personal level. How did you decide as an organization to allow multiple stakeholders to create content and/or post on your social networks? Nessa Ferrell (Wolf Trap): This structure was already in place when I arrived at Wolf Trap, but I’ve found that everyone is excited to contribute to our social presence. Our organization works really well as a unit. Having multiple stakeholders from various departments contributing to content ensures we have a nice, well-rounded, approach to our strategy. Since everything is routed through me, or through a small group of individuals on the Creative and Marketing team, we are able to ensure the content stays on brand. In addition to coordinating with specific departments, we hold brainstorming meetings to allow our creative juices to flow – which results in both great content ideas and camaraderie. Jonathan Stiles (Pennsylvania Ballet): The biggest factor in this decision was the fact that Pennsylvania Ballet’s administrative offices are in a different location than our studios. The logistics of having a staff person at the studios as well as taking care of their work in the office made it hard for us to get as much content as we needed. Allowing dancers to gather and post content gave us many more behind-the-scenes assets. It’s a similar situation when it comes to all the great things our school and Community Engagement department are doing. We don’t have enough staff to be at all their events so team members from those departments will send us photos and videos. Do you use any collaboration tools or software to help manage this process? 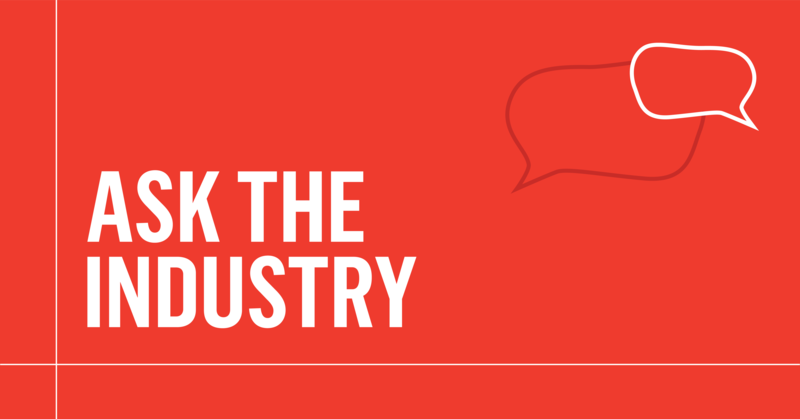 If not, how do you keep track of all stakeholders’ content? 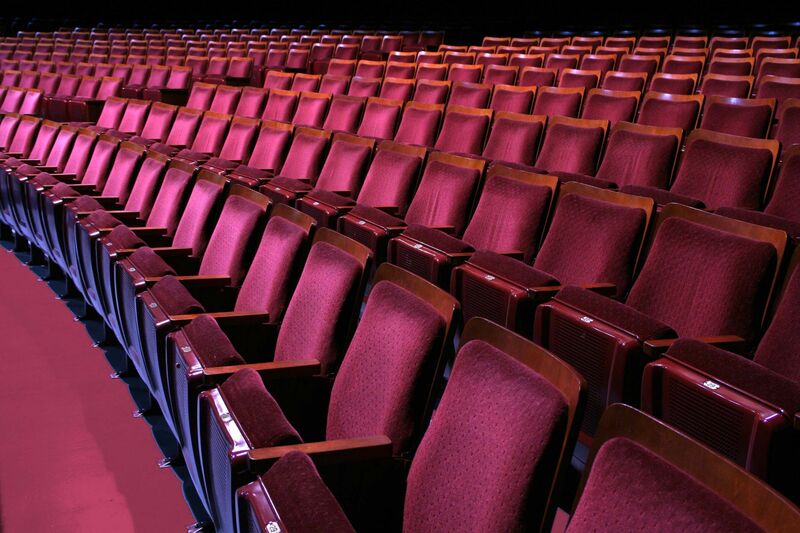 Natasha Porizkova (AT&T Performing Arts Center): Our team uses Sprout Social. Sprout allows our team to see every comment, Tweet, mention, location tag displayed in one clean feed. From this feed, we can respond to action items. For example, if a patron asks where our box office is located or needs more information on an upcoming show by commenting on one of our social platforms, their question will show up as an action item on our Sprout feed. The action item is marked as complete or removed once someone responds to the message. Using this response marker ensures one person doesn’t receive multiple different answers while also keeping social management concise and efficient. 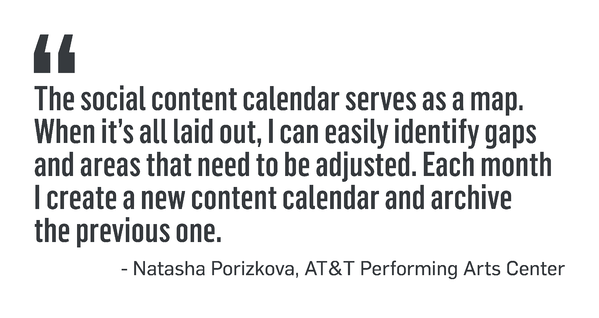 Additionally, I created a social content calendar when I first started working at AT&T Performing Arts Center. The calendar is accessible to everyone in the company through our shared server. Since it’s an Excel sheet, it gives viewers the option to filter the calendar by shows, dates, and platform. Not only does this help stakeholders in the company who may need to find a scheduled opening, but it also helps me keep track of everything. I am only human, just like the rest of us, and from time to time I draw a blank as to whether I published an article, shared an image, or made the same unbearable pun! The social content calendar serves as a map. I never want to bog down our followers with too many posts in a day about a specific show. When the calendar is all laid out, I can easily identify gaps and areas that need to be adjusted. Each month I create a new, clean content calendar and archive the previous one. 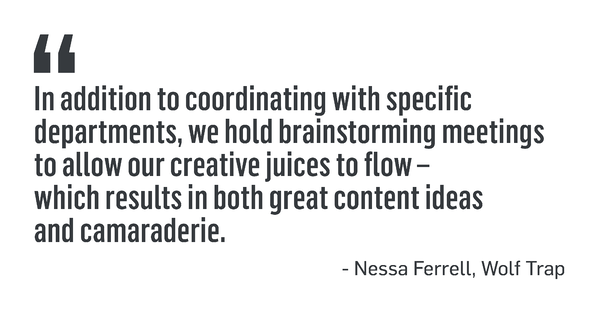 Nessa Ferrell (Wolf Trap): On a day-to-day basis, we use Google Docs and Adobe Shared Review to route content. We also have a communications calendar that tracks organization-wide events/activities and a social media request form that other departments can fill out at the beginning of a campaign or project. Additionally, we have monthly department meetings where we discuss a variety of topics, including social needs. Jonathan Stiles (Pennsylvania Ballet): The dancers create and post in-studio and behind-the-scenes content for Instagram. We will often text or email photos and videos from the freelancers (or archives) that they request. For everything else, we use Basecamp to keep people on the same page. What is the division of labor? How do you eliminate the potential for duplicate content? Laura Bowman (Pennsylvania Ballet): Our dancers handle organic Instagram content, and I handle everything else including responding to comments. Occasionally I ask the dancers add a subscriptions post or promote an upcoming event, but otherwise, they really have free reign. We are fortunate that the dancers leading the account respect the rules established in the Dancer Guide distributed at the beginning of the season. Nessa Ferrell (Wolf Trap): I am responsible for monitoring the day-to-day social presence and all comments and customer service matters. However, if our platforms are particularly busy during a specific time – such as the day we announce our summer season - other members of the Communications and Marketing team may step in to assist. During these periods, we check to make sure that someone else has not answered before proceeding. On show nights, we have an on-site team monitoring the platforms. Each team member knows which channels they are responsible for monitoring so we don’t cause overlap. Additionally, team members must run all content by me before posting. If they see something that might be timely to post on social, they send it to me first to vet and then add into the calendar. Have you created guidelines? If so, can you share some examples from these guidelines? Nessa Ferrell (Wolf Trap): We have guidelines in terms of how to respond to specific user questions and commentary. We aim to answer every inquiry, both positive and negative, efficiently and professionally. In terms of creating posts, we have a staff document to help them develop content before passing it along for feedback. The document has guidelines on how to think about voice, audience, objective, and provides best practices. Jonathan Stiles & Laura Bowman (Pennsylvania Ballet): When the dancers first volunteered to post on Instagram, we met with them to discuss a variety of guidelines. We ask that they follow the company approval process, which ensures the entire dance company is being shown and requests that they do not respond to comments as the company. Additionally, all photos and videos must be approved by our Artistic Director, and if images or videos highlight three dancers or less, those dancers must give their approval for use. This can take a bit of time but ensures everyone is happy with what is being highlighted on Pennsylvania Ballet’s social networks. How do you ensure your organization’s tone and voice remains intact? Jonathan Stiles (Pennsylvania Ballet): To be honest, we needed to let go of a bit of our control when the dancers started posting. We did so knowing they would have a more ‘in the moment’ voice but also that they respect our organization’s standing in the community. 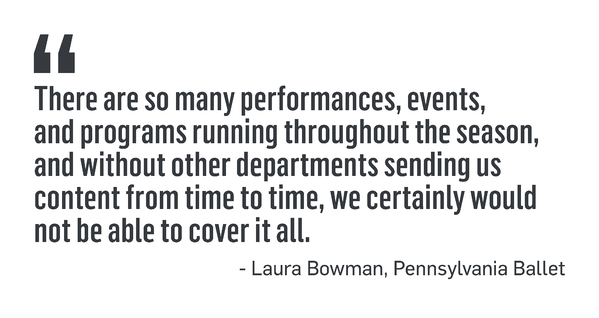 Laura Bowman (Pennsylvania Ballet): I try to keep our organizational voice about seventy-five percent professional and twenty-five percent fun. I’m still working on the engagement part a little bit. If someone could create more dance emojis, that would help too! Natasha Porizkova (AT&T Performing Arts Center): All content and copy is written and posted by me. This keeps a consistent tone and voice for AT&T Performing Arts Center. I receive requests from other departments, but I always ensure the final product matches our brand before it goes out to our collective 100,000 social media fans and followers. Have you run into any challenges? If so, how are you attempting to address them? Nessa Ferrell (Wolf Trap): The biggest challenge I run into with having multiple stakeholders is that, depending on the time of year, we have difficulty finding room on the social calendar to fit all of the moving parts. However, I am very fortunate that everyone involved in the process is respectful of the calendar and discusses potential content with the Marketing and Communications department early on in the process. As soon as I know that there’s something in the works, I slot it into the calendar – even before anything has been finalized to keep it on my radar. Last minute content can sometimes be a challenge, especially when we have to squeeze it into the calendar. Depending on importance, something may get rescheduled or removed from the calendar altogether. Another challenge is brand consistency. However, I feel that by allowing all of the social material to go through one person, our messaging stays consistent, on brand, timely, and valuable to our audience. Laura Bowman (Pennsylvania Ballet): We’re a small staff that is trying to have a significant presence on social media. Generating social content must be a team effort, and we’re lucky that we have staff in a variety of departments that are willing to pitch in. There are so many performances, events, and programs running throughout the season, and without other departments sending us content from time to time, we certainly would not be able to cover it all. Additionally, a personal challenge always seems to be getting ahead of the game with content and visual assets. This year my goal is to schedule posts further and advance. That way, when additional points of interest come up last minute (such as feature articles or TV segments) we can just add those to the schedule. Of course, getting ahead can be a challenge when you're relying on dancers to send you content for a weekly post or waiting for choreographers and stagers to complete enough of a ballet for you to get the assets you need. However, with proper planning I think we can make it happen!